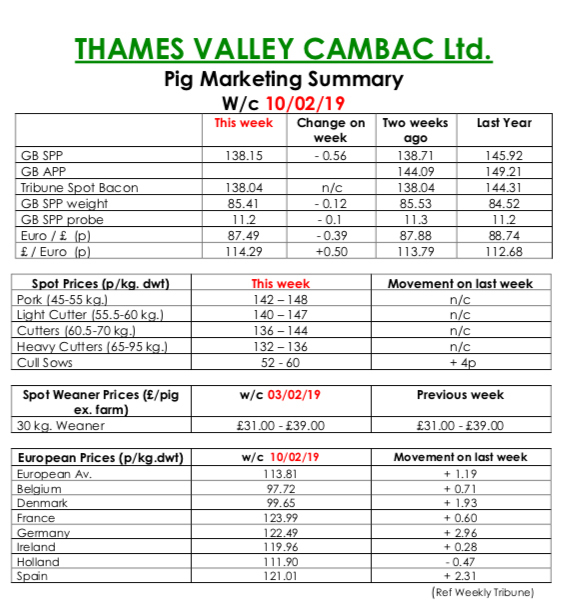 This week’s Pig Marketing Summary from Thames Valley Cambac reported that supply tightened slightly this week, with many producers indicating that lower numbers were to follow in the coming weeks. Demand was similar with most majors planning standard kills but no extras. Contract price contributions saw a welcome stand on, but the SPP fell 0.56p. There is a feeling that a price recovery will be triggered by tighter supply rather than better demand, so may start sooner rather than later. The summary reported that fresh meat wholesalers were a touch easier to deal with, and prices saw little change. 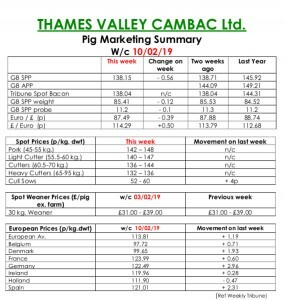 The star of the week was the cull sow trade that improved 4p due to buoyant prices on the continent. The influential German market increased 4 eurocents on the back of tighter supply, and Denmark and Spain were up 3. All quotes in sterling were tempered however by a weaker Euro that ended the week down 0.39p at 87.49p. The Weaner Marketing Summary for week commenced February 3, reported that supply saw little improvement, as poor production issues continued. Demand was similar, but current feed costs are taking the shine off bids. The prices announced by the AHDB saw the weighted average for a 30kg store pig quoted at £43.37, and the weighted average for a 7kg weaner rise by £2.59 to £37.29.